Proponents of the Big Bang point to CMB (Cosmic Microwave Background) radiation from the original fireball as strong evidence for the Big Bang's validity. When CMB was discovered, the fellas won a Nobel Prize, probably because secularists like science that fits their worldviews, even though things haven't been thought out well enough. Image credit: NASA (click on the link to see a short animation of the presumed initial explosion and afterward). Even though the original Big Bang concept was an explosion (and is still referred to that way), the whole story keeps evolving. (That's because evidence keeps interfering with the secularist mythology of origins and cosmic evolution, and they refuse to admit that evidence supports the Bible's claim that God created the universe, and did it recently.) The question has been raised, "Where are the shadows?" If the background glow was way, way out yonder, celestial bodies should cast "shadows". 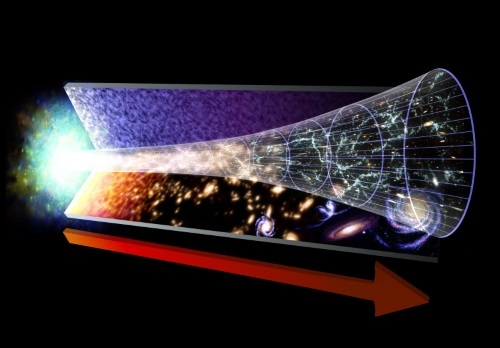 One of the alleged ‘proofs’ of the big bang model of origins is said to be the Cosmic Microwave Background (CMB). The radiation was discovered in 1964 by Penzias and Wilson for which they won the Nobel prize in physics. Soon after their discovery, it was claimed that this radiation is the ‘afterglow’ of the original ‘explosion’ or fireball of the big bang. Since the time at which the radiation, which started as heat, was emitted from the fireball, the universe has allegedly expanded by a factor of 1,100. Thus, that ‘afterglow’ radiation has ‘cooled down’ to much longer wavelengths (‘stretched’ from the infrared to the microwave portion of the spectrum). These are detected by microwave telescopes today. According to theory, the big bang fireball should be the most distant light source of all. Thus all galaxy clusters would be in the foreground of this source. Therefore all CMB radiation must pass the intervening galaxy clusters between the source and the observer, here on earth. This radiation passes through the intergalactic medium, between the galaxies in the clusters, and is scattered by electrons, through inverse Compton scattering, now known as the Sunyaev–Zel’dovich effect (SZE). When this happens, the path of the CMB radiation is interrupted and distorted. To finish reading, click on "‘Light from the big bang’ casts no shadows".